Hello! I hope you had a nice weekend! We had a busy weekend of yard work but yesterday we were able to relax a bit by the pool and enjoy the fruits of our labors. We have a nest of tiny babies in our bird house chirping and butterflies and bees were buzzing all around. I’d like to add a few more plants to our landscape that attract pollinators. I did a little research and here’s what I came up with! We’ve lived in this house for nearly fifteen years and began the yard work on Day 1. We added a swimming pool and fence with lots of planting beds. Now, the trees are mature and provide lots of privacy to the backyard. That’s important because of the pool and the street behind the house. We’ve tried to create a private oasis in our backyard. The backyard is Lacey’s oasis too! It’s also turned out to be an oasis for birds, bees, and butterflies. (not to mention snakes, frogs, rabbits and deer.) Here is a chart I found of colors and plants that attract bees, butterflies and hummingbirds. The top row is: attract hummingbirds. I was pleased to learn we already have several shrubs that attract bees and butterflies like Weigela, lilac, azalea and hydrangea bushes. We planted a few annuals this year that also attract pollinators to our yard such as impatiens, petunias, and millions bells. We have a “few”perennials the bees and butterflies love such as Shasta Daisies, black-eyes Susan, Salvia and Hostas. Bees and Butterflies also like a good herb garden and are attracted to mint, oregano, lavender, parsley and chives. Thankfully for them we have an abundance of mint! Also, I understand that mint is a deterrent for mosquitoes. Double win! 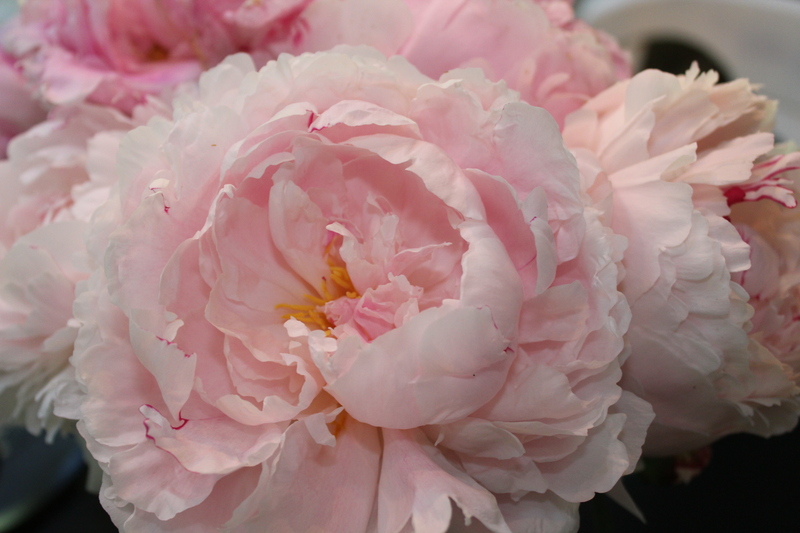 And don’t forget about Peonies! I think I love them more than the flying insects! I’ll send you more, sweet sister! Your flowers and yard are gorgeous!